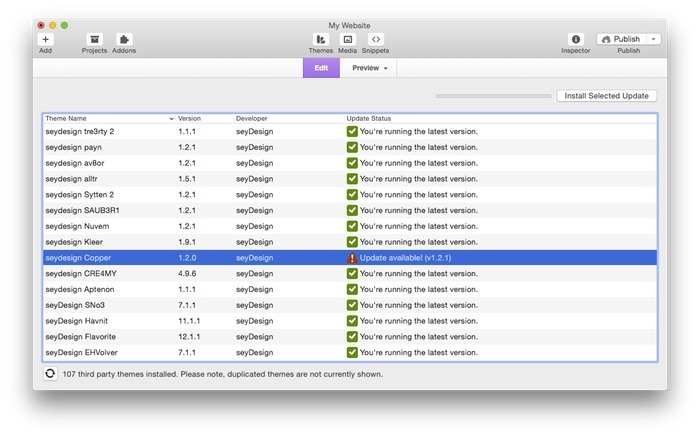 Keep your RapidWeaver themes up-to-date. Is there a better alternative to Waterfall? Is Waterfall really the best app in Developer Tools category? Will Waterfall work good on macOS 10.13.4? Waterfall automatically keeps your RapidWeaver themes updated for you. Easy, Automatic Theme Updating for Both RapidWeaver 5 and 6 - The hassle of manually updating themes is a pain point every RapidWeaver user has run into as some point. Waterfall is your effortless theme management tool, specifically designed to help save you time and prevent the headaches all too often associated with theme updating. [New] Easily access the backup files that Waterfall creates for you, by clicking on the "Display backup files" button in the Page Inspector. [Fixed] An issue which would display duplicates of a single verified email, rather than an entry for individual email. Waterfall needs a rating. Be the first to rate this app and get the discussion started! At a glance info - Easily see the important details you need, like what the version number is, who the developer is, and whether there's an update available. Effortless Updating - Gone are the days where you'll need to manually download and apply theme updates. Quickly see if an update is available, and install it with the click of a button! Automatic backups - Waterfall backs up every theme it installs an update for. Lost customizations and mistakenly deleted theme images are now a thing of the past. Why, hello there, peace of mind! Time Guardian - Waterfall could quite easily save you many hours of effort. No more wasted time backing up files, manually updating themes, or trying to figure out what version you have installed. Already built into many of your favorite themes - Over 80 Waterfall-enabled RapidWeaver themes are available. The latest versions of all ThemeFlood, Henk Vrieselaar, WeaverThemes, Yabdab, seyDesign and NimbleHost themes already include support for Waterfall. Other developers, such as Joe Workman and more, are also adding support for Waterfall. We've also provided a dedicated site where theme developers can get all the information they need to add support for Waterfall. Don't see your theme developer listed? Be sure to ask them to do so! [Known Issues] After installing an update, if you click on the refresh button, Waterfall will display the old version details, rather than the new info. This does not mean the update was unsuccessful, just that Waterfall is displaying incorrect information. Restarting RW will allow Waterfall to display the correct information.